A UPS driver delivered more than a package to an assisted living facility in Atascadero in late May. The driver also kicked a small dog before assaulting the dog’s owner. On May 28, Tim Paulsen arrived for the afternoon shift at a 15 person assisted living facility in Atascadero with his two dogs, Patch and Bonnie Bell. The white American Eskimo and black Scottish Terrier work with residents at the facility. The dogs ran up to the driver barking and the UPS employee responded by kicking Patch in the head. Patch rolled on the ground howling, prompting her owner, Paulsen, to run towards the driver. The driver then shoved Paulsen, who had broken ribs in a motorcycle accident several years earlier. Richard, a resident at the facility who witnessed the incident, said the dogs are very friendly and were not acting aggressively. Richard asked that his last name not be published. After the residents went to bed, Paulsen called the Atascadero Police Department. The department is putting together a report it plans to send to the San Luis Obispo County District Attorney’s office in the next few days, Commander Joe Allen said. The driver told officers he felt threatened by both the dog and Paulsen, Allen said. Surveillance video at the facility captured the incident. Officials at UPS did not disclose if the driver was reprimanded or the driver’s name. Nevertheless, Paulsen said he has seen the driver working the same route since the incident and does not think UPS handled the incident appropriately. If the dogs were trained and under the control their owner, they should have never been close enough to get kicked. I love dogs, but I’ve also been bitten by a dog. I side, in this case, with the driver who had TWO dogs running at him and threatening him. I could be wrong but doesn’t the leash law only apply to public property? Maybe it also applies in instances where individuals have access to your property? Given that these dogs were so often let loose around so many people who were relative strangers i really doubt that they are aggressive (they were companions at the old folks home, right). I doubt the ups man knew this though, and i can understand why he was frightened of this little dog. But his reaction was probably overkill. As a usually good rule of thumb, i have found that bared teeth is a pretty good indication of whether a dog is actually aggressive or just yappy (though i’m sure there are exceptions). Word is he has been seen in his brown truck doing his well paid job. Unions. 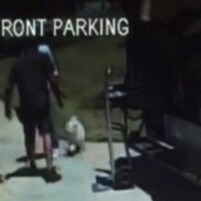 Video shows me that a barking husky dog rushed the UPS man and he defended himself. UPS drivers, postmen, meter-readers all have good sense regarding animals — they enter the animals territory every day as part of their job. If the driver felt threatened, he needs to defend himself. From the video, it looks like he was threatened. Both by the white dog, and by the owner. These dogs are around the elderly and they are yippy dogs, not attack dogs. The owner of the dogs was posturing with his fist, it did not give the driver the right to push him ie assault him. hope he got some time off without pay to think about how he might wish to act next time. Man I’d rather take a good bite than kick a little dog running happily up to me wagging its tail. UPS man proves he’s just having a crappy day when he takes the time to set his hand truck up then give the man a good shove. Open the wallet time and release this loose cannon! The UPS driver is a total @ss for kicking the dog but so is the owner. If his dogs had been on a leash which is the law, he could have prevented this entire situation. He’s lucky the dogs weren’t run over, etc. I only feel bad for the dogs. Perhaps a more suitable solution would have been to push the dog….and kick the owner. Are you saying that the driver biting the dog is an infinite improbability?